Yesterday I went to a promo lunch at the Perrotin gallery for Mr Lagerfeld's first foray intro interiors - ie. he drew some glass designs for the Swedish brand Orrefors. It was a little insane... Karl was mobbed by 30 journalists / bloggers / photographers to within about one metre, at which point an imaginary barrier seemed to suddenly appear and remind everyone of their manners. The monochromatic German watched a film of himself on a gallery wall whilst the newly coined glasses perched ceremoniously on plinths under glass cheese domes. Karl looked like Karl. His rose-gold-backed iPad was rather covetable but his best accessory was his confidante and personal gatekeeper. Casually androgynous, she wore a black tux with diamante encrusted flat black loafers while nonchalantly owning the room of baying journos. The whole affair was very Paris. There were parquet floors and discreet outfits - beige macs, pumps, striped shirts. Karl's glassware was kind of Scandinavian though. And yes, he drank Diet Coke with lunch. Karl Lagerfeld, Creative Director at the French fashion house Chanel, yesterday launched his first venture into homeware. Collaborating with the Swedish brand Orrefors, the designer unveiled a range of 12 glasses that included champagne flutes, wine glasses and tiny tumblers like votive candle holders. 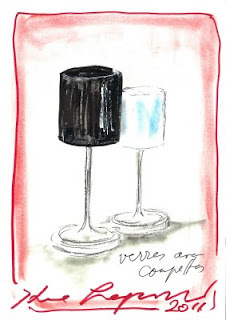 Alongside traditional clear glass were some opaque black and white styles which caused distress among Parisian design editors who like to see the exact hue of the wine they are drinking. Mr Lagerfeld held a lunch for 40 members of the international press at the very hip Perrotin gallery in the 3eme arr., at which he spoke on the timeless elegance of Swedish design, before tucking into his pudding of pineapple slices - the fruit, a popular motif in this summer's fashion collections, is known for its fat fighting properties. This collaboration is set to be repeated on an annual basis and could yield some exciting creations considering the style maker's chameleonic personal home decoration aesthetic, which has veered between palatial Louis XIV grandeur and rainbow hued postmodernism by the Italian design studio Memphis. This initial foray into decor is extremely restrained however, and all the pieces are simple and linear. There are more rightangles than is usual for glassware; the champagne flute is positively rectangular. 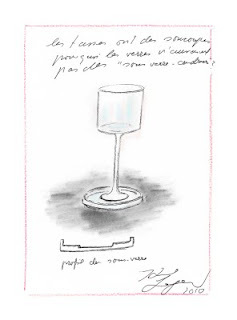 Prices begin at 75 euros for one glass and go up to 1100 euros for a limited edition vase. They go into stores in September, and quite remarkably, will be stocked at John Lewis, along with Harrods and Selfridges.